Few condiments in this world offer the complimentary culinary delightfulness that a chutney can provide. The best part about it is that making one is extremely simple, can be done in about 20 minutes, and is equally as tasty when served hot or cold. Creating and serving a chutney will spruce up any generic baked meat and turn it into an exquisite fine dining entrée. In this particular chutney I used seasonal ingredients meaning they will have the strongest flavor, contain more nutrients, and are more easily obtained as a locally produced ingredient. 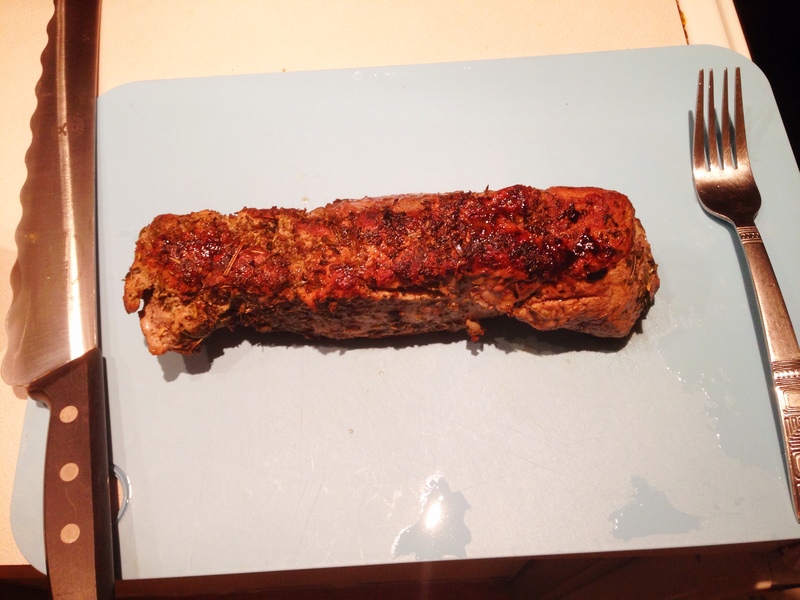 Below I served it with a delicious herb encrusted pork-loin where you will learn how to get an aw-dropping sear! 1. 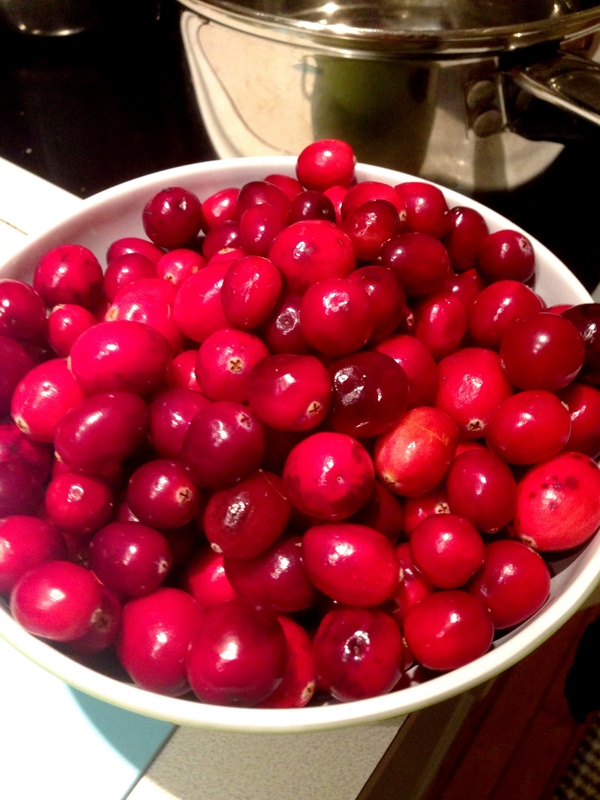 Rinse your cranberries and place them in a pot with the 1/4 cup water on medium-low heat. 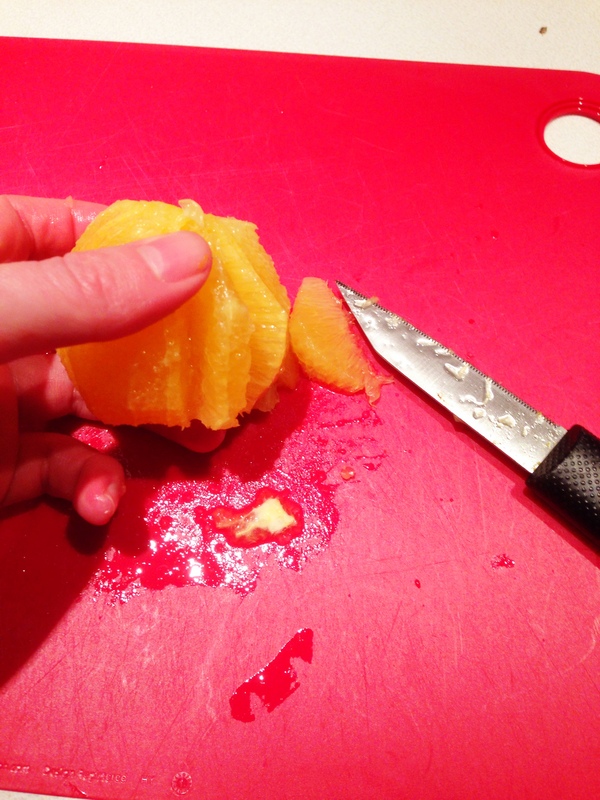 Meanwhile, gather your fresh ginger, peel and dice into very fine pieces and add to pot of cranberries. Continue to zest the outside of the oranges over the pot, being careful to avoid the lighter color peel that is very bitter. 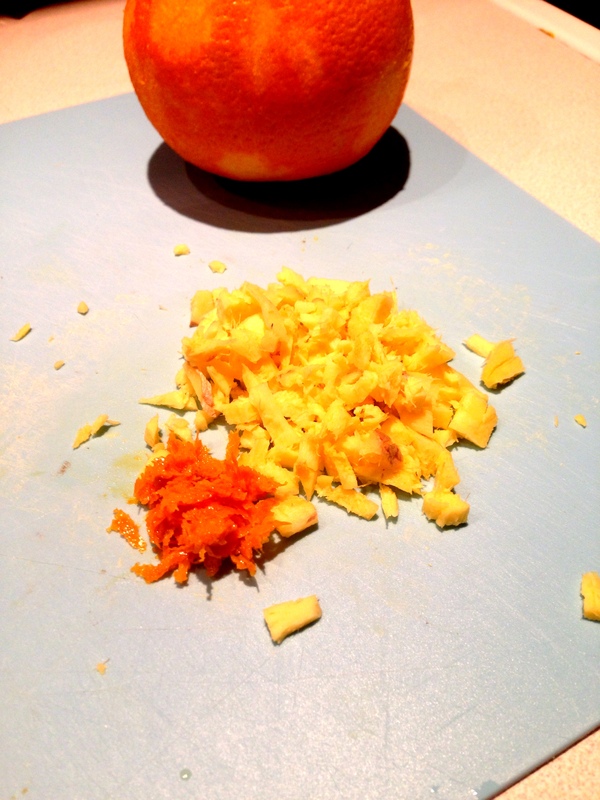 Then, peel the oranges and discard. 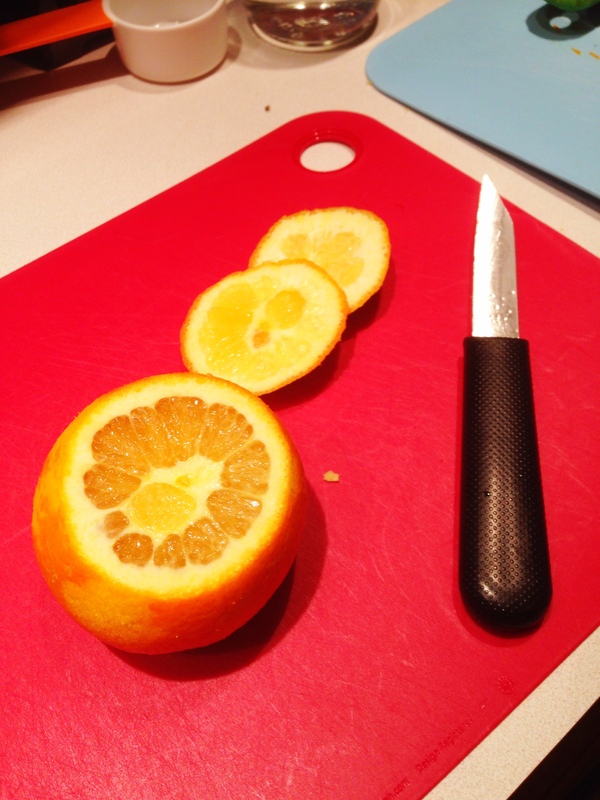 Next step is to supreme the orange, this allows you to gather the delicious fruit while avoiding the pith, chop into small pieces and add to cranberries. 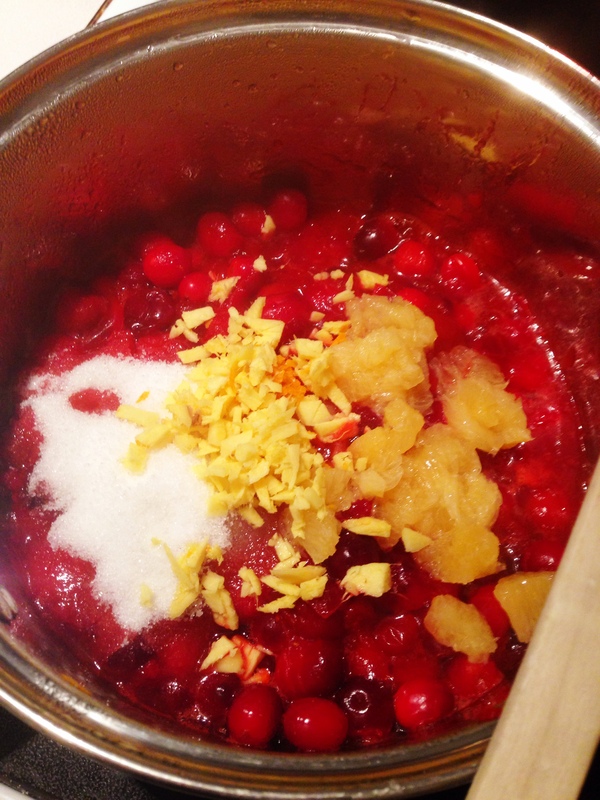 Lastly squeeze the oranges over the pot with the cranberries and add the sugar, stir to combine and simmer for 15 minutes on low heat until consistency is thick, similar to jam. This can be served hot or cold and stored in the refrigerator for 5 days. 2. Preheat your oven to 350 degrees and place a skillet or sauté pan on medium heat with the butter. 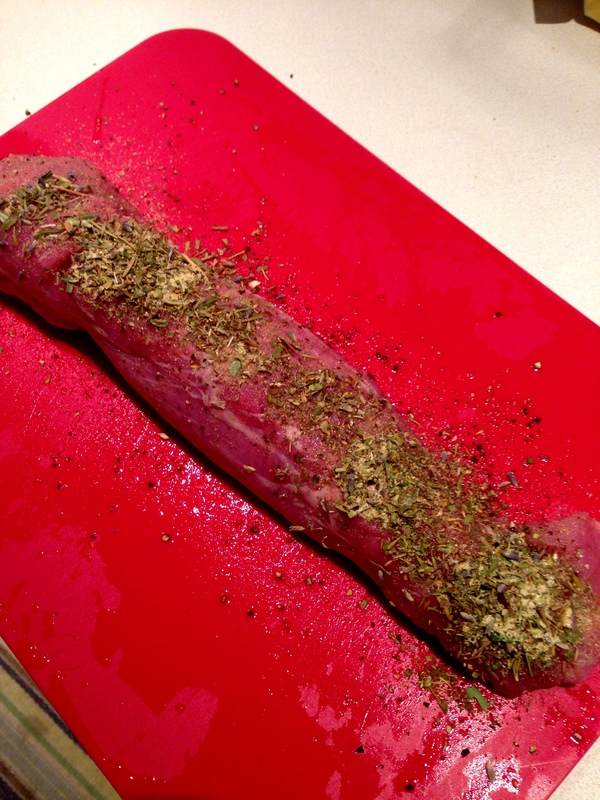 Place your pork loin on a flat surface and season with herbs de provence, garlic powder, red pepper flakes, and fresh ground pepper. When searing, it is important to ensure the pan is the perfect temperature. 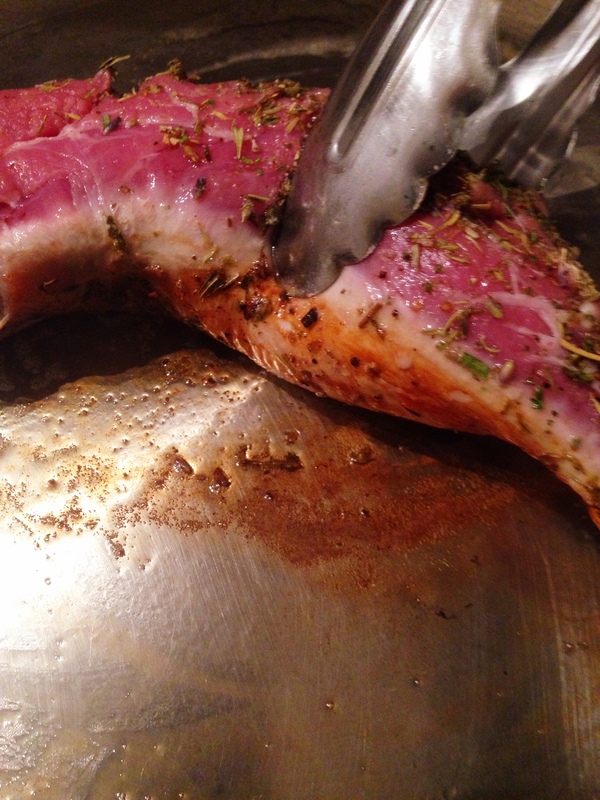 To high will cause a lot of smoke and burning while too low will create a very unappetizing color in your meat. So, leaving the pan on medium heat for a few minutes allows it to heat thoroughly and evenly while you do prep work. When placing the pork in the pan it should sizzle without smoking, if it smokes, just pull the pan off the burner (keeping the pork in) until it cools off a bit. 3. 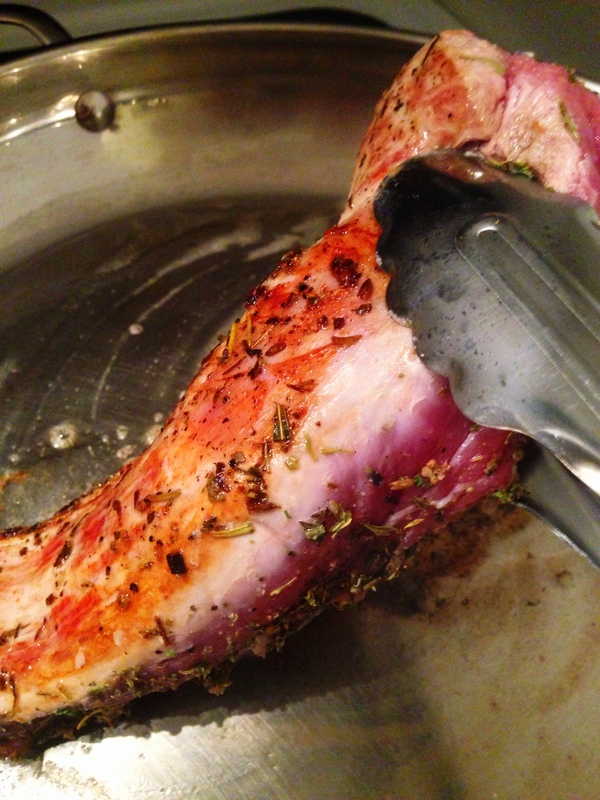 Once your pan is heated and ready, place the pork loin in and allow it to sear on each side for approximately 3 minutes. Once you have a nice toasty crust, squeeze the lemon juice on top of the pork and into the pan to de-glaze the flavor that is stuck to the bottom. Continue to place the entire skillet into the oven to continue cooking for about 30 minutes, if you are using a teflon pan, make sure to transfer the pork into an oven safe dish. Cook the pork until the temperature reaches 145 degrees or the juices run clear. 4. 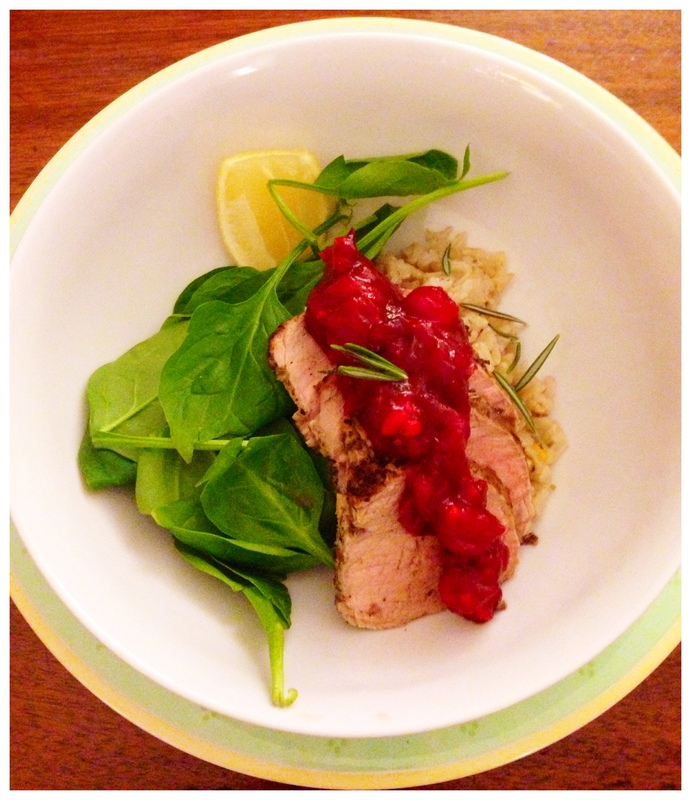 I served this with some leftover brown rice and fresh spinach – enjoy! 1. Select a medium sized pot and place the whole chicken breasts inside, continue to fill the pot of chicken with water until the chicken is covered by 1 inch of water. Place on the stove on medium heat and let it come to a low boil. 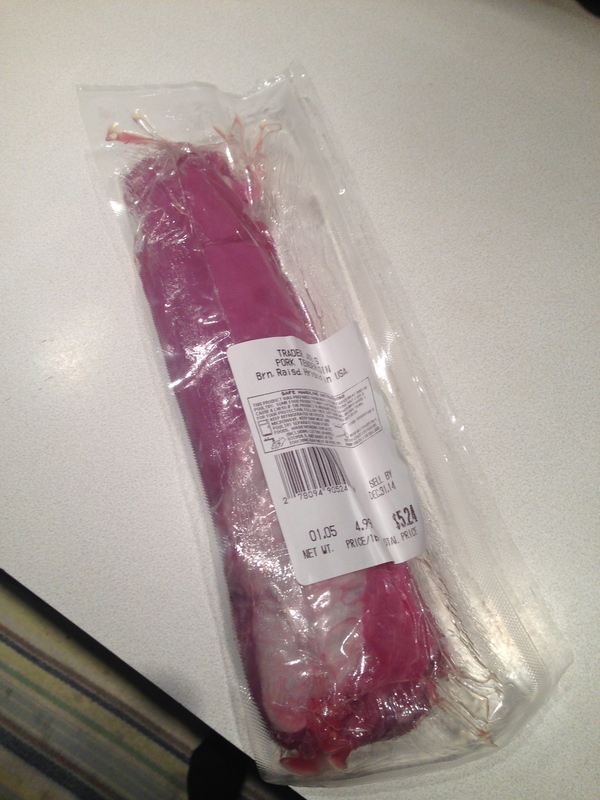 Cook for 15 to 20 minutes until it is no longer pink int he middle. 2. 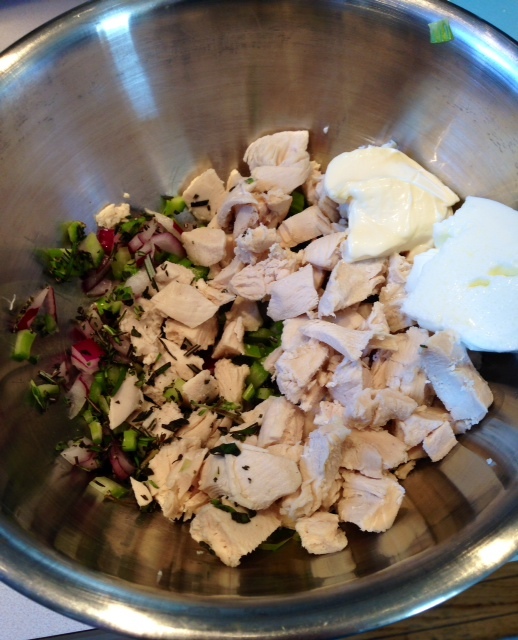 While your chicken is cooking, grab a cutting board, knife, and medium sized mixing bowl. Dice your onion and celery, try and do this as small as possible to help make your bites nice and manageable. Place diced onion and celery in the bowl. Slide the leaves of rosemary and oregano off of the sprigs into the bowl with the celery and onion. 3. When your chicken is finished, remove from heat. 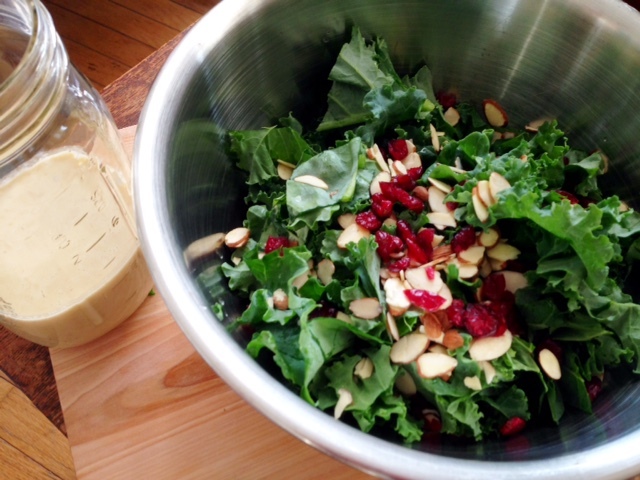 Take each piece out with a fork, shaking any excess water, and place into the bowl with the vegetables and herbs. With a fork in each hand, shred the chicken into small pieces while it is still warm. You can do this by tearing the pieces apart using both forks together, this will take a couple of minutes. You can also dice chicken into small pieces as seen below in the photos. 4. 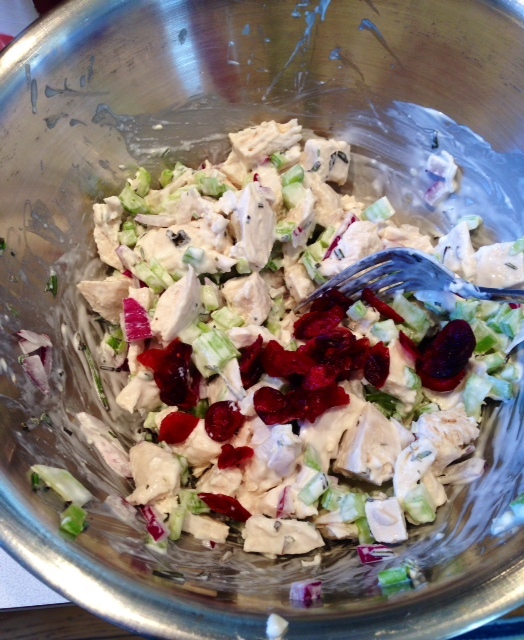 Once you have shredded the chicken, place 1-2 tablespoons each of low fat mayo and plain yogurt into the bowl. You can adjust this to your liking. Mixing the chicken with everything while it is still warm will allow the mayo/yogurt to be “stretched” further and as a result you will not need as much! 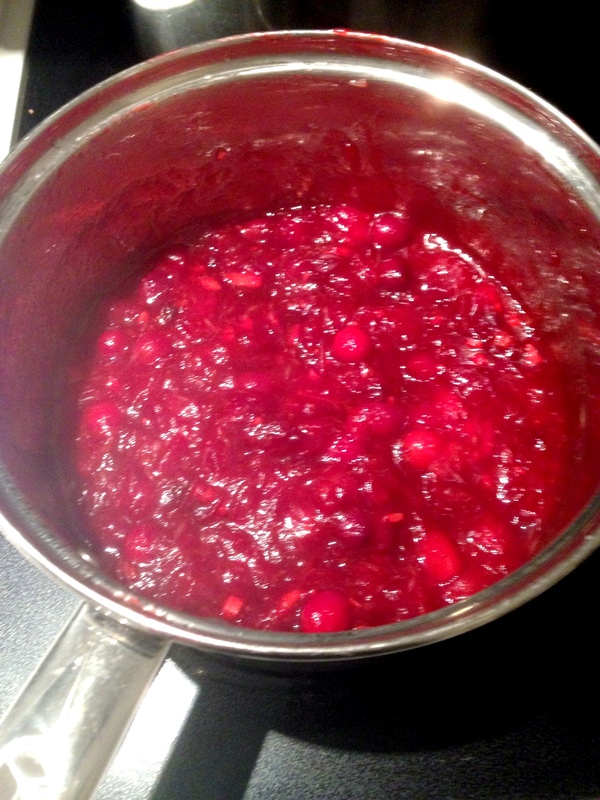 Sprinkle in your cranberries and squeeze in the lemon juice and mix together! 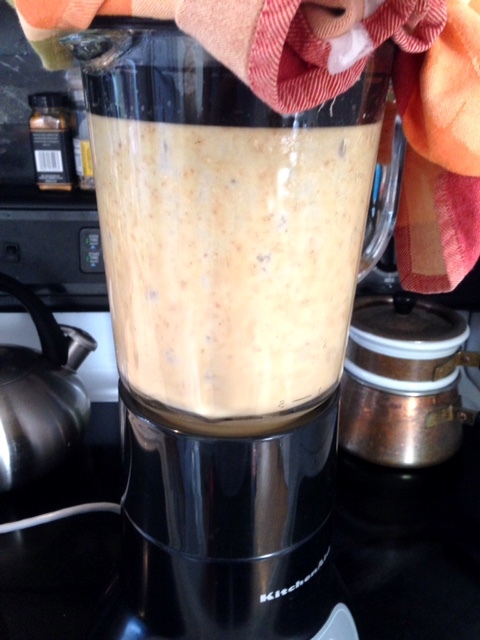 This tastes good while it is warm but if it weirds you out, stick it in the fridge for about an hour before serving. 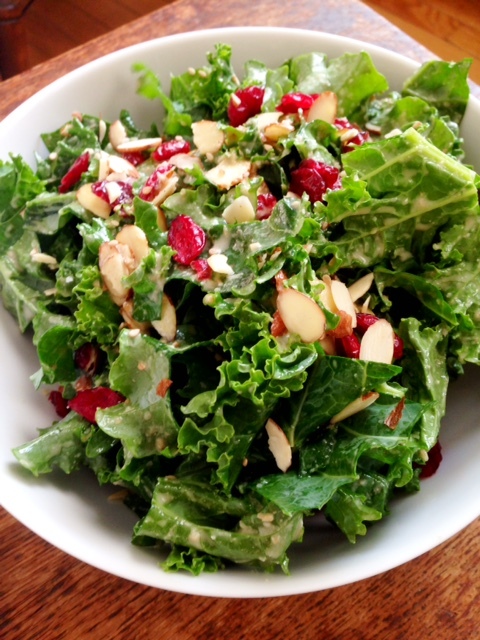 This chicken salad is delicious by the spoonful, on top of fresh mixed greens or romaine lettuce OR on a sandwich or lettuce wrap. Substituting or adding cucumbers, carrots, bell pepper, and any fresh herb will be quite delicious! Continue to make it interesting by adding humus or a bit of crumbled goat cheese to your wrap or salad- lets talk about how excited you are for lunch tomorrow MMMM!! !